It is unfortunate that most species of birds kept in US aviaries today are those destined for the pet trade. There are some truly wonderful aviary subjects that don't make good pets or should not be kept as pets. Many softbills fall into this category, as do some of the parrots. To be good aviary subjects, in my opinion the birds should be active, colorful, and have a good personality. A bird that just sits and seldom moves could just as well be replaced by a plant and it would save you a lot of work. There is a group of parrots that are the best of both worlds. Most make excellent pets, and all make great, entertaining aviary subjects. These are the birds of the Subfamily Loriinae. With over 50 species and many more sub-species, there being 22 sub-species of the 'Rainbow' Lory Trichoglossus haematodus alone, there is certainly something for everyone. With imports of lories halted into the US (Canada can still import), except for USFWS approved captive breeding consortiums, it is imperative that we get to work at producing these wonderful birds in our aviaries. True, some lories don't make good pets. An example would be the Musschenbroek's Lory Neopsittacus m. musschenbroekii. These little guys will bite you as they are being hand fed! But they make wonderful aviary birds. I've even kept them in planted, mixed softbill aviaries, where they got along fine with everyone, except some of the plants. Musk Lories Glossopsitta concinna are another nippy species, best kept as aviary birds. On the other hand some species of lories make wonderful pets. In this group I would include the Chalcopsitta. This Genus includes some of the largest lories. They can be loud, but can't be called screamers, usually making lots of noise only when very excited, especially at feeding time. These are the Black Lory C. a. atra, Duivenbode's Lory C. duivenbodei, and the Yellow Streak Lory C. s. sintillata. Also included in this Genus is the Cardinal Lory C. cardinalis; while these beauties from the Solomon Islands would probably be good pets, they are far too rare in aviculture to wind up in someone's family room. Also good as pets are the birds of the Genus Lorius. These are also some of the lories with the best talking ability. They include the Chattering Lory L. g. garrulus and L. g. flavopalliatus, the Yellow-backed Chattering Lory. The several sub-species of the Black-capped Lory L. lory would be included here as well. Not to slight any lory pet owners, I suppose we need to mention the other birds with acceptable pet qualities. The Eos are generally good pets. These include E. bornea, the Red Lory, E. reticulata, the Blue-streaked Lory, and E. squamata, the Violet-necked Lory. Black-winged Lories E. cyanogenia would also make good pets, but belong in breeding situations due to their scarcity in captivity. The birds of the Genus Trichoglossus can be great pets or among the worst, depending on species and even on the individual bird, much like Amazon parrots. Among the better ones as pets are the Edward's Lory T. haematodus capistratus, and the beautiful Australian Swainson's or Blue Mountain Lory T. h. moluccanus. One to avoid as a pet would be the lovely Ornate Lory T. ornatus. The ones that I have had have always been nippers. Other species fall in between, the common Green-nape T. h. haematodus being one of those that is either a wonderful pet or an untrustworthy biter. What makes these birds special as aviary subjects? One thing is their hardiness. Most can winter outside in many areas of the US and possibly western BC, given proper shelter. I've seen many photos of them rolling in the snow in both European and US flights. Most of the smaller Charmosyna species don't take the cold too well at all, so certainly some research would be necessary before just assuming that you can keep them in cold climates. I have found the Red-flanked Lorikeet C. placentis to be one that I can not keep in Fallbrook unless I heat in winter, which I choose not to do. On the other hand, my Stella's C. goliathina and Striated C. multistriata seem unfazed by temperatures that drop below freezing overnight. Fairy Lorikeets C. pulchella look uncomfortable at these temperatures, but the only losses have been to very young chicks as the pairs will often start breeding in January. If this is the case I must change the nest material every other day, as any dampness in the nest at all means loss of chicks. They are a problem in this respect because even the parents defecate in the nest, causing it to become wet very quickly. In the wild this species nests in bromeliads rather than in a tree cavity, so all of the moisture would drain from the nest. Nearly all lories will sleep in a box at night, even when not breeding, so it is fairly easy to provide them shelter. Mine are housed in suspended cages except for the odd pair that I will keep in with my softbills in the planted aviaries. The cage dimensions are 2' or 3' wide x 3' high x 6' long. I have a 10" extension on the front of the cage where the feed door is. This allows the placement of food and water where the birds can not get directly above them to avoid contamination. The nest boxes are hung on this same end, hanging on the front of the cage. I use a variety of shapes and sizes of boxes. Some are boot or 'L' boxes, others are regular grandfather clock style. Some are as large as 12" square by 24" deep, others as small as 9" square and 11" deep. Many are constructed with a pull out tray to facilitate cleaning. As most species of lories only lay two eggs, a huge box isn't necessary. The only lories that I have that lay three eggs are the Musk on occasion. If one nestbox doesn't work I switch to something else. If the birds are not willing to breed it is the easiest change to make. Often it makes the difference. The same is true of breeders that constantly break their eggs. Try a different style or size of nestbox. My aviaries are only covered on one half of the top and have only a lattice panel or plants to provide shelter or visual barriers on the perimeter. I have no visual barriers between the cages which are spaced about 2" apart to keep toes intact from nippy neighbors. I try and avoid keeping pairs of the same species side by side when possible, although birds of the same Genus are often next to each other, Fairies beside Stella's, etc. Another thing that adds to lories' appeal as aviary subjects: there is very little mess to clean up. Unlike a pair of rosellas or little Neophemas, where you must rake seeds from the floor and scrape dried droppings from the perches and wire, lories have completely liquid droppings that disappear into the ground cover beneath my cages. The cage bottoms are just hosed off when refilling the water bowls. Very simple, very neat. I feed Lory Life Nectar daily along with fresh fruit. This usually consists of apples, grapes, and papaya for those that eat it. Their far and away favorite fruit is fuju persimmons, which have a short season in the fall. They especially like the fruit when it becomes over ripe and is high in sugar content. I offer Lory Life Powder along with the Nectar to birds that are rearing chicks. I only feed once a day, in the early AM. Most chicks are parent reared except for the few that I do sell as pets, these being the Yellow-streaks and Swainson's. I do pull other chicks if there is a problem with improper feeding or being feather plucked in the nest. Musschenbroek's are especially bad about this. I also find birds plucking if the nest is not kept dry. They will peel thin strips of plywood from inside of the box to try and keep things dry, and tend to pull young feathers at the same time. Avianweb Comment Re: Nesting log / nest-box material: Suitable options are decomposed non-toxic saw dust, corn cob, wood shavings (i.e., Aspen shavings) or other suitable materials. Please note that wood shavings - such as pine, cedar and redwood - give off aromatic hydrocarbons (phenols) and acids that are toxic and can cause dermatitis, allergic symptoms and irritation of the digestive tract. They should not be used in cages, aviaries, or nestboxes. The larger the wood chips the better, so the parents don't feed it to the babies or the chicks accidentally ingest it. Other options for nesting material include shredded news paper and clean straw / dried grass. Certainly there must be something negative about lories as aviary birds? Maybe a couple of things but don't let them deter you. Most importantly they should, for the most part, be housed one pair per cage. I have successfully colony bred Meyer's Lorikeets T. flavoviridis meyeri, in a group of three pairs. These were housed in a 4' x 6' x 6' walk-in aviary with an extra nestbox, much like the breeding of lovebirds. A major problem with this set-up is never being sure who the real parents are. One male could have bred all three hens. This makes accurate record keeping impossible. I certainly don't recommend this method. It is very important to note here also that many species of larger lories seem to actually enjoy killing other birds, most notably the Genus Lorius. I had a pair of Chattering Lories L. g. flavopalliatus housed in a huge aviary that contained a large tree, a Myoporum. The aviary was originally meant for a pair of Red-sided Eclectus Eclectus roratus polychloros, but due to their complete lack of personality (might as well have had apples in the tree), they were replaced by these red and green clowns. On the floor of this cage lived a pair of Button Quail. They would produce chicks from time to time and the lories seemed to pay them very little attention. Then one day there was just a bunch of headless quail on the floor. The lories had discovered a new game and bitten every one in the head! Some of the zoos that have walk-in flights where the visitors offer nectar to the lories have found this to be a problem as well, especially those that tried to mix Black-caps and Chattering with the smaller Eos and Trichoglossus species. I have kept a variety of lories, one pair at a time, in planted softbill aviaries with few or no problems. These were usually the smaller species like Meyer's or Goldie's Lorikeets. Musschenbroek's were sometimes used as well. The worst thing was some chewing on the plants that the softbills don't do at all. For this reason you must be careful which plants you use. For softbills I seldom worry about the toxicity, as they, with few exceptions, do not harm the plants. If small parrots are to be added this needs to be considered. Currently I have a pair of Stella's Lorikeets in a large planted softbill aviary. They have bitten off all of the plants in the hanging pots, usually just biting then cocking their head to watch it fall. Also, they tend to dominate the other birds, even though many are much larger than they. This is not a problem as there are three feeding stations in this flight, which is about six hundred square feet, and they can't be everywhere at once. It is interesting to note how many other species of birds in this aviary enjoy the lories' nectar, especially the Black-spotted Barbets Capito niger and the Pied Barbets Tricholaema leucomelaina. The Leafbirds Chloropsis hardwickii seem to eat more than the Stella's! Lories are also excellent aviary subjects because there seems to be a pretty steady demand for the offspring of most species. Not just for the pet trade: I probably receive more requests for Stella's and Fairies than I do for pet Swainson's or Yellow-streaks. So if you need to be able to sell a bird to justify keeping them, lories fill the bill here as well. There are two lory organizations in the US (which should be combined! ): the first is the American Lory Society, c/o Bobbie Meyer, PO Box 450, Livermore, CA 94551 ($15 per year). There is a quarterly publication pertaining to all aspects of lory keeping, including pets. We are working to compile a census of the species in captivity to see which ones need the most work. Some 'common' species we are finding not to be so common as we thought. The ALS also holds Lory Symposiums. The first was in San Diego in 1997 where it was well attended. In 1998 it switched coasts to New Jersey and will be back in San Diego for 1999. 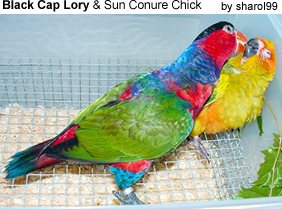 The second lory society is the International Loriinae Society, c/o Phyllis Martin, 1314 SR 60 West, Plant City, FL 33567 ($15 a year); quarterly?? publication seems to appear when the editor has enough material. Nevertheless it contains valuable information on breeding lories as well as lory conservation in the wild. The ILS also serves as the oversight group for a consortium working with all of the lory species in the Solomon Islands. We have permits from both the US government and that of the Solomons to remove 30 pairs of each endemic lory species for captive breeding in the US and Canada. In 1997 we imported our first group, the Yellow-bibbed Lory Lorius chlorocercus. These were followed in 1998 with the Cardinal Lory Chalcopsitta cardinalis. Both of these species have produced young in the aviaries of consortium members. Our next group we won't see until the spring of 2000, but what a way to start the new millenium; they will be the beautiful little Duchess Lorikeet Charmosyna margarethae. This consortium is unique in that the proceeds from the sale of the captive-bred birds will be returned to the Solomon Islands for their education and conservation work. It is not a group for anyone looking to make money on breeding these birds, but rather an opportunity to work with some species that most of us have never even seen. In conclusion, if you are undecided about what to put into those new aviaries or are thinking of getting rid of those boring old Australian parakeets, I hope I've been able to point you in the right direction. Lories are the answer!